Jess and the gang: You got all that from feet?! There's something about my kids feet that always gives me perspective. I take pictures of their feet all the time. The shoes they wear say something about the stage they are in, about their personality and the season of life we are in. The size and where their feet land, or don't land, also tell a tale of where they are at in this journey of childhood. 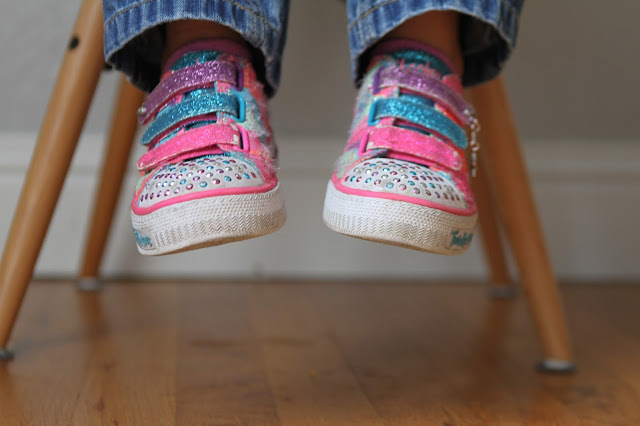 I often find myself pausing to see how close to the floor my kids feet come when they sit in different chairs, knowing in far too soon, their feet will be touching. I am constantly reminded how childhood goes by in a flash. Sure, my own childhood didn't necessarily feel that way, but watching friends kids become teens and adults, it just weirds me out. Then knowing that in a flash my own kids will be there. I want them to enjoy this time now to the fullest. They will never have the ease of no responsibility again. They will never again have the joy of eating what they want without abandon or recklessly spending all their birthday money on something pointless. So, as they do it now, I hope they remember. I hope they come out of this childhood of their with magical memories, just like I have from mine. Sure, I can remember the awkward times, feeling like an outcast at school or fighting like cats and dogs with my brothers...I remember packing up to move in with my aunt a time or two when I was just over life with my brothers! But I choose to focus on the magical moments. How my dad always was willing to sit in the backyard so we could swim, or how he would play hide and go seek in the dark with us when my mom wasn't home. Or how my mom turned our home into something truly magical at Christmas and I always loved being greeted with that cinnamony smell when I came home from school. There was also the riding of plastic trays down the slides at Mcdonald's, which, oddly enough, the workers always seemed to get angry about. Or my brother and I being sure to grab each other's report cards from the mail before my mom could get them. Growing up, figuring our who we are and our place in the world is such a complex process. It's one I hope my children feel they get to do in a safe home, full of love. In a home where they feel safe to chase their dreams, even if those dreams seem crazy. In a home where failure is allowed because it means you tried. In a home where love and joy not only abound, but are a given, and give them the confidence to follow their crazy dreams. See, I told you you would be shocked that I got all that just from looking at some feet!